Since 1971, Lettuce Entertain You has been introducing restaurants with fun ambiance, quality food, and stellar service. From French fine dining flair to American classics and creative cocktails to decadent milkshakes, your options are endless with the Lettuce Gift Card. Gift cards are available in $10, $25, $50, $75, $100, and $250 amounts, with egift cards available in amounts between $10-$500. You cannot reload your gift card; once you reach a zero balance you must purchase a new card. You can also join the Frequent Diner Club to earn points for every meal you eat at a Lettuce Entertain You restaurant! Experience what Lettuce Entertain You has to offer at one of the 90+ unique establishments in Illinois, Arizona, Minnesota, Las Vegas, California and the DC Metro area. For more information on Lettuce Entertain You, visit www.leye.com. National Gift Card is the best place for you to order gift cards in bulk. We are the experts in all things gift cards and can set up your gift card solutions program for you today. 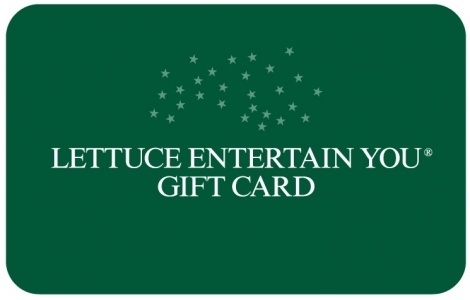 Please contact us for more information on Lettuce Entertain You bulk, direct-to-recipient, or individual gift card fulfillment for your gift card program. Contact us online or call us at 888-472-8747 today.